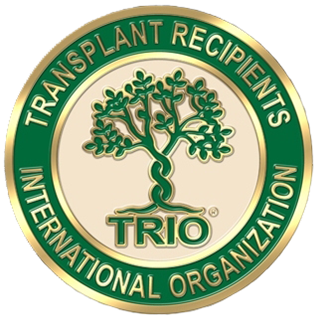 Welcome to the TRIO (Transplant Recipients International Organization) Post-Transplant Cancer (PTC) web site. "Receiving a diagnosis of cancer can fill anyone with an undeniable sense of dread. With the global prevalence of various cancer forms seemingly growing by the day, the notion that “this won’t happen to me… it happens to other people” is beginning to phase out. Cancer is touching more and more lives. "Think about it… you probably know at least one person who has battled this disease. But if it hasn’t affected someone very close to you, how much do you really understand about the impact it has on a person’s life? Awareness campaigns like 'Forever Changed' are going beyond ‘knowledge is power’ initiatives, generating proactive plans that provide support where it is most needed. "Cancer is spreading… It’s touching everybody’s life. Young and old, cancer is likely to affect each of us in some capacity or another at some point in our lifetimes, and for some, perhaps even on more than one occasion. It can happen to you. It can happen to a loved one or even a colleague. While not a very comforting thought, it is the stark reality that few can now ignore." On this TRIO post-transplant cancer education web site for transplant recipients, you will find structured educational material and videos to. . .
1st: LEARN about and raise your awareness of cancer risk for transplant recipients. Once aware of the higher risk . . .
and importantly . . .
3rd: how to deal and LIVE with cancers that affect the majority of long-term transplant survivors. Finally you will have . . .
4th: LINKS to resources that will help you go further in this life-saving learning process. 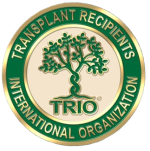 TRIO invites you to come, enjoy and learn how to live a long cancer-free healthy life with your transplant. > more . . . 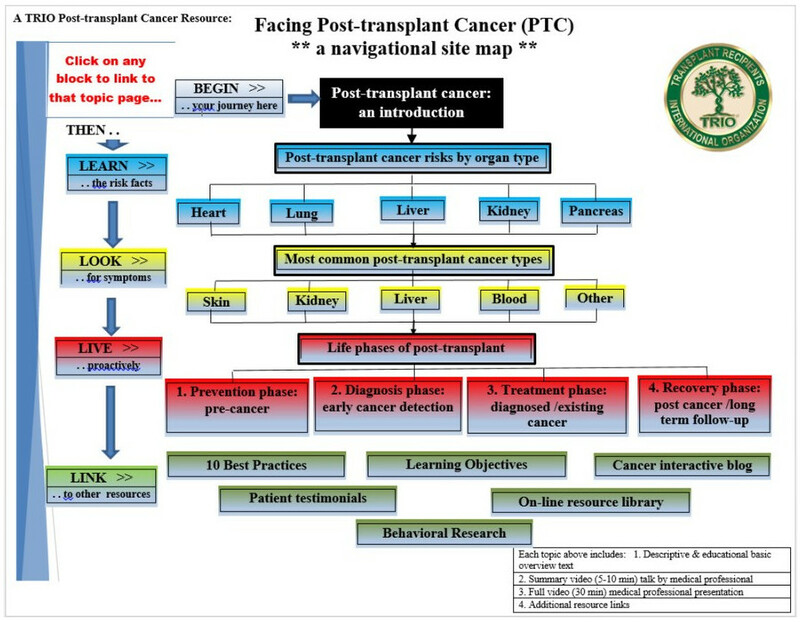 Note: Content is being added as our research progresses, with the more popular topics being expanded first, ie., organ type: kidney (80% of transplants are kidneys); cancer type: skin (most common cancer by far in post-transplant patients) - since that will serve the greatest number of patients first. Background for this web site and TRIO's PTC project. How did this TRIO Post-Transplant Cancer (PTC) project come about? The story: Steve, a TRIO San Francisco chapter leader from the West coast, called about a recent TRIO member death due to cancer. He gave me a challenge of “What are we going to do about it?” and my response was "Yeah, right! What can WE (TRIO) do about cancer?" What an overwhelming challenge! But reflecting on that further, somebody should do something about that and who better than TRIO to do it? A quick return call to Steve with that thought, asking if he was willing to come together as a team to tackle the task of trying to find out what we could do by asking medical experts on the subject resulted in TRIO taking on this 5-year Post-Transplant Cancer project. This is a work in process, with the web site content being developed over time and a formal web site design launched in 2015. Today you will find the early results of our research with many topics obviously still under development, more being added every week. Editor's comments . . . I am personally passionate about this effort because of my own personal experiences of early detection and treatment of prostate cancer, kidney cancer and now years of skin cancers as I pass my twenty-third year with this amazing heart transplant (done in 1994). Each has been just a ‘bump in the road’ and not a death sentence due to that ‘best practice’ of early diagnosis and treatment, some by due diligence, some by blessed chance and good proactive medical care of very caring doctors and nurses. Yes, we welcome your support for this important effort. 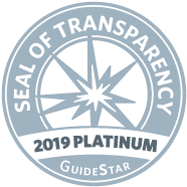 As you will see in the LINKS (RESOURCES) section, we host a series of recipient success video testimonials sharing what they learned through their life experiences dealing with post-transplant cancers. If you would like to share your own story, write to INFO@TRIOWEB.ORG with your contact information so we can talk about that opportunity. To get a full understanding of this PTC site and its twenty-four topics, see a complete map in the 'colorful org chart' representation below. This was our original design and While its no longer an 'interactive map' with active links to each topic, you can better see the flow that is now possible with the more user friendly design seen in the final production site you are on here today.